If any other movie in 2013 can possibly rival Man of Steel and The Lone Ranger in terms of squandered potential, it’s the first – and hopefully only – collaboration between director Ridley Scott and writer Cormac McCarthy. It’s baffling to just think about how spectacularly this movie fails on its own terms. An all-star cast ensemble, a respected director and one of the most prolific American writers of the 21st century should have crafted something enjoyable to watch at the very least. But instead, we’re treated to a truly baffling disappointment that each member of the cast and crew will probably be swiping under the rug sometime soon. Ridley Scott has been on a downwards path in recent years, with additional clunkers like Hannibal, Kingdom of Heaven and last year’s sequel/prequel/who cares to his own Alien franchise starter Prometheus taking up the space on his shelf. The director has also gone through some tough times in his personal life, most notably the tragic death of brother and fellow director Tony Scott which occurred during the making of this film. Of course, anyone with a heart and soul can understand that losing a close family member is always going to be a difficult thing to comprehend, and we at Film Feeder have nothing but the deepest gratitude for Scott’s family and friends. However, Scott seems to have let his emotion-fuelled rage dominate the overall look of this film and it ends up looking just a bit too brutal and bitter. At times, he doesn’t even seem that interested in making McCarthy’s already-complicated script a coherent film for audiences to follow closely, and instead making everything out to be a hollow and depressing visual experience. You have to wonder if “depressing” turned out to be Cormac McCarthy’s first word as an infant – don’t forget, he also wrote the books for No Country For Old Men and The Road, both severe downers in their own right – because his first original screenplay is not short of the feeling. Without spoilers, it unfolds as a “nice guys finish last” narrative, which although strangely welcomed amongst other films that stick firmly to the hero tradition does not rub off well with its viewers. That’s not to say all we want is happy ending after happy ending, but if you’re going to go this route then it needs to have logic, not “depression for depression’s sake,” which this film sadly does to alienating affection. It probably wouldn’t matter so much if the characters and story were strong enough to stand their ground. But no, we find ourselves constantly in a position where we simply do not care for anyone nor anything that is happening to them. The titular lawyer (Michael Fassbender), who remains nameless all throughout, is very vague about why exactly he wants in on a drug deal headed by a couple of drug barons (Javier Bardem and Cameron Diaz) and a business associate (Brad Pitt) in the first place. It’s clearly not to lavish his girlfriend (Penelope Cruz) with luxurious gifts, since we open the film with them in bed in a reasonably nice apartment and him taking her to a fancy restaurant. If it’s to get ahead in his law firm then that’s unaccounted for, because we never see him actually in practise during a court session or do anything significant to identify as a lawyer (aside from a scene he shares with prison inmate Rosie Pérez, but that’s just “a” scene). If the movie does not take the time to properly set this character up before he makes his decisions, then why should we care about what happens to him or those closest to him? McCarthy does like to keep things vague in his books, but that particular trick does not work entirely well as a screenplay and confuses rather than intrigues us. You might have noticed in that last paragraph that the characters were never mentioned by their name, just by the actors playing them (they do have names though, titular character aside). That is another major problem with this movie; we never really see the characters as McCarthy wrote them but instead the highly-recognisable A-list actors brought in to play them. They’re all very talented actors, but even they can only do so much when they’re restricted by the wordy material. Fassbender reunites with director Scott after being one of the only memorable aspects of Prometheus, but despite his strong presence he is stuck in a role that we ultimately do not care about, as stated before. Bardem, returning to McCarthy territory following his Oscar-winning turn in No Country For Old Men, is once more saddled with the “mad eccentric dude with a bizarre hairstyle” archetype, while real-life spouse Cruz – who he does not share scenes with – is given nothing to do except play the bewilderingly naïve girlfriend of Fassbender. Pitt’s character turns out to be even more of a pointless addition, doing sod all except sit around talking in metaphorical sentences while he wears a cowboy hat, but when he states at one point that he has the power to just legally disappear off the face of the Earth it doesn’t help that one of the most successful and recognisable actors on the planet is trying to pull this off sufficiently. It’s Brad Pitt; he can’t walk into a newsagent without being recognised. As a result, hat particular line of dialogue falls flat entirely because of who’s saying it. The most notable offender on this cast is sadly the one who seems to be trying the most. You have to admire Cameron Diaz for taking on a role outside of her comfort zone, but it doesn’t really work as well as it should have. Perhaps what makes it a major misfire is the incredibly poor attempt at a Barbados accent that her character is supposed to have. Recent reports have surfaced that Diaz had to redub her lines because she originally sounded identical to Rihanna, which you can definitely believe while watching the final cut when it becomes more and more obvious that it’s dubbed. The redubs, however, completely hide that fact that she is supposed to be of a foreign descent, and sounds unquestionably American with only a few twangs of an accent here and there. When she says to a character late in the film that it’s “typical of you Americans” [paraphrased], you’ll be bawled over in surprise that Diaz wasn’t playing an American all this time. Like the rest of the cast she does fine despite what little has been given, but it’s a poor try at an accent by a recognisably Hollywood actress. Not to mention she is front and centre in what is undoubtedly going to be the only scene people will take away from all of this. It needs to be seen to be believed so shan’t be spoilt here, but for now let’s say it involves Diaz and a car. It is incredibly silly even by this movie’s standards, and is sadly one of the many moments that verge on unintentional hilarity. One of the other ones involves the death of a major character near the end of the film, made all the more laughable by the method of which it is carried out. It looks more like a typical Itchy and Scratchy cartoon than a dramatic development in a po-faced thriller, and any hints of seriousness die along with the victim. But by the end, we are left with the one question that just thinking about it damages the film even more: what was the point of all that? Once we reassemble ourselves to counteract that downer of a denouement, we take the time out to really think about the events that took place and what they all added up to in the end. The answer seems to be not that much; nothing was really gained, nothing important in the grander scheme of things was lost, it’s all just water under the bridge. Maybe that was McCarthy’s intention that it was all for nothing, but this backfires on an audience who wanted to see more severe consequences to the main character’s actions. It even ends feeling incomplete, like there were a whole range of stories that needed to be wrapped up but never were. It’s a pain in its paw, but that can be argued as being The Counsellor’s greatest flaw: in a grander vision, everything had no purpose and no real payoff, exactly the opposite of what we paid to see in the first place. 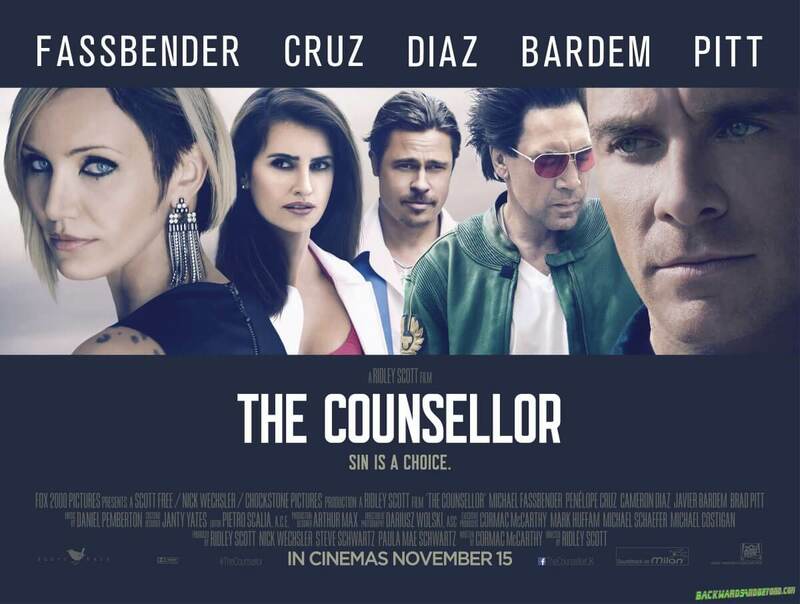 The Counsellor is a giant waste of potential, despite the attempts of the far-too-starry cast to add weight to a clumsily directed, overly written and aggressively dark and depressing thriller with one too many silly moments that destroy any attempt at dignity and, above all, a great big sense of pointlessness. If Ridley Scott is going to keep declining in quality like this, then he’s seriously going to need counsel.